Corn planted later will germinate and emerge more quickly, and go through crop stages faster than corn planted early. Typically, corn requires about 100 growing degree days (GDDs) to emerge and about 200 GDDs to reach the V2 growth stage. An accumulation of about 475 GDDs is required to reach V6, the stage when the growing point moves above ground. Wet soils cause nitrogen losses, and determining how much nitrogen is lost is necessary to choose the proper management options. In cases where high intensity rain results in high runoff, leaching losses will probably be low. The primary nitrogen loss mechanism in saturated soils in Kentucky is denitrification, which occurs when soil nitrate nitrogen (NO3-N) is converted to nitrogen gas by soil bacteria. Two to three days of soil saturation is required for bacteria to begin the denitrification process. Well-drained upland soils that have been wet from a series of rains probably have not experienced much denitrification. Soils in lower landscape positions that stay saturated longer will likely lose more N. Losses can be calculated by estimating 3 to 4 percent loss of fertilizer NO3-N for each day of saturation. Use the Table below to determine how much fertilizer NO3-N was in the soil. A very wet April has prohibited any early soybean planting. Little, if any, soybeans have been planted as of April 25. Wet weather forecast through the end of April indicates soybean planting may not get started until after May 1. Be patient; we still have time to get good yields on soybeans. Recent soybean planting date research in west Kentucky indicates soybean yield losses do not normally occur until after mid-May. So we still have about three weeks to plant soybeans for top yield potential. Soybeans planted after May 15 to 20 has an average yield loss of ½ bu per acre per day, and soybeans planted in early June has an average yield loss of 1 bu/acre/day. Currently, soil temperatures are adequate for planting soybeans, but wet soil conditions are not suitable. Planting into wet soil conditions can result in sidewall compaction, poor emergence, and a reduced soybean stand. According to the latest Kentucky Pest News, armyworm populations are tracking similar to the outbreak years of 2006 and 2008. Armyworms can cause problems in corn, wheat and other grass crops. Stay tuned to population counts to see if management is necessary. In the same Kentucky Pest News, Ric Bessin writes that the EPA has approved SmartStax refuge in the bag, being marketed as SmartStax Refuge Complete by Monsanto and SmartStax Refuge Advanced by Dow AgroSciences. See the latest Kentucky Pest News for more information. Common seed-treatment fungicides provide a fair amount of protection against seed and seedling diseases. It’s always a good idea to monitor corn stands for emergence and stand establishment, but I am less worried about widespread seedling problems than I am about leaf diseases. Continued sogginess could eventually result in major delays in planting. Corn crops planted in early to mid-May and beyond are at greater risk from a variety of destructive diseases, especially gray leaf spot, northern leaf blight, and southern rust. We’re not at that stage yet, but it is worth being aware of this potential risk. Tom Priddy, with the University of Kentucky Ag Weather Center sent out the following link for April rainfall history. With six days left to report, Lexington and Frankfort both have the wettest April in history. Louisville is less than an inch from beating its record totals for rainfall. Bowling Green is fairing much better with 'only' 6.82 inches so far. No doubt many of you are finding ways to keep busy while we all wait for fields to dry by fixing the old tractor that always leaked fluid, mending the fence that the calves always seem to break at weaning, or cleaning up the shop, or... perish the thought... catching up on the honey-do list. One more thing you can do while you wait for the weather to clear up is to take a look at the Kentucky SoyMVP report for 2009 and 2010. 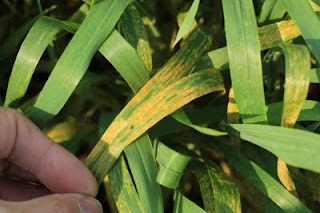 Be on alert for stripe rust. 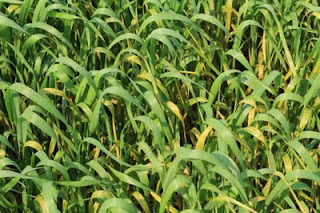 The disease may have overwintered in your area and there may be some hot spots that could serve as fuel for a rapidly developing problem on a field by field basis. I wrote a KY Pest News article on this a couple of issues ago. It may not be a problem, but it is easy to miss things this time of year unless active crop scouting is taking place. The disease level in this particular field really increased over the past two weeks. Phil Needham said he has seen stripe rust in other fields too, but this one in Oak Grove is the worst so far. Still, there may be fields with a similar level of disease. For information on management of stripe rust go to Chapter 7 of the Wheat Management Guide. Figure 1. Stripe rust in wheat. Figure 2. Stripe rust in wheat. Are University Corn Planting Date Recommendations any Good? The recommended window to plant corn in central Kentucky is April 15 to May 15. Yet, many producers will plant earlier than this if the weather allows. Often, we hear that the first fields planted have the best yields. But, this observation is confounded, because the earliest fields planted are often well-drained and best suited for early planting. So, were the high yields due to early planting or good soils or both? In an attempt to get at this question, data from production farms in central Kentucky were evaluated only for planting and yield. Other variables such as soil type, hybrid number, hybrid maturity, seeding rate, weed control, etc. were not considered. Each data point on each figure represents planting date and yield for a single field in a single year. Figure 1 is the combined data for all years and the x-axis is “day of year” where 105 = April 15, 120 = May 1 and 135 = May 15. Yields in 2005 were extremely low and most planting dates were between April 10 and April 25, about the earliest planting for any of the years. 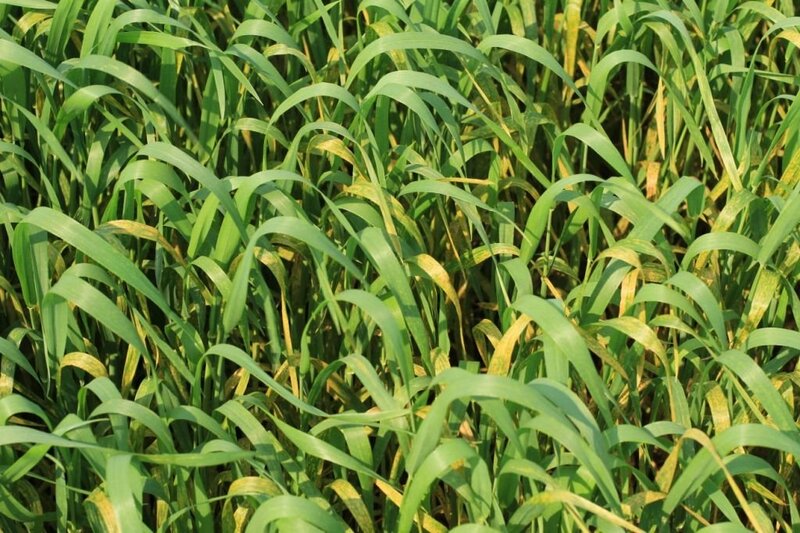 The the USDA rates about 81% of Kentucky wheat either good or excellent for the April 3, 2011 reporting period in the Kentucky Weekly Crop and Weather Report. Meanwhile, the USDA reported that only 37% of the wheat was either good or excellent in 18 states for the same reporting period. Considering how much of the wheat was behind just a month ago, this report is good news. While we are not out of the woods yet, this is a promising start as wheat joints and pushes toward the flag leaf. There is still a chance for a freeze event, as the 50% probability for final freeze is around April 15 for much of southern Kentucky. Also, producers need to check stands for any signs of diseases as well. Even though there are some risks to this crop, it nice to hear some good news.